Josh Grant and Dungey battled for the lead early, Dungey got it and Roczen was quickly around to take second. Jason Anderson was there too. Roczen stood Dungey up before the finish line jump to take the lead and Dungey immediately started fighting back. He showed Kenny a wheel and made light contact with Roczen twice, but couldn’t make a repass happen. 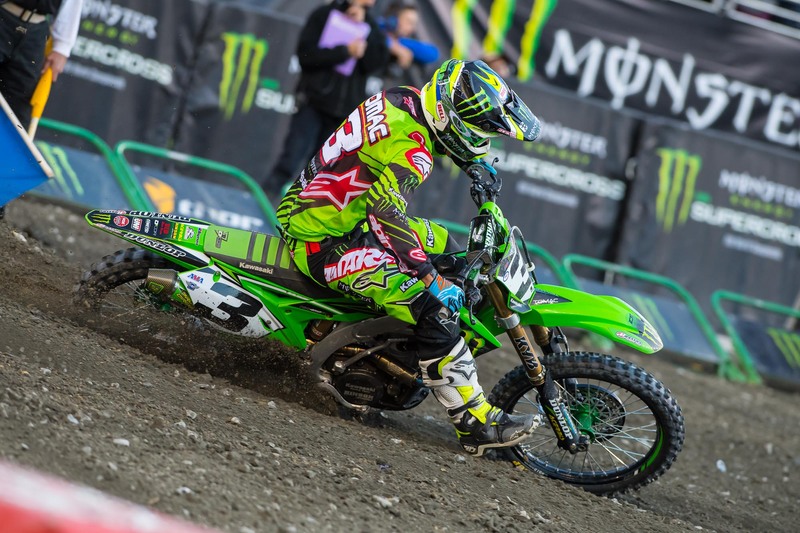 Meanwhile, Eli Tomac had a rare good start, and then he got past both Grant and Anderson to get to third. He wasn’t finished. Soon he started closing on Dungey, and then five laps in he made the pass! He still wasn’t done. Tomac kept charging and started to slowly close the gap on Roczen. This set up a classic Roczen/Tomac battle. On lap three Jake Weimer crashed and was run into by Justin Barcia and then Broc Tickle. That set that trio to the back. 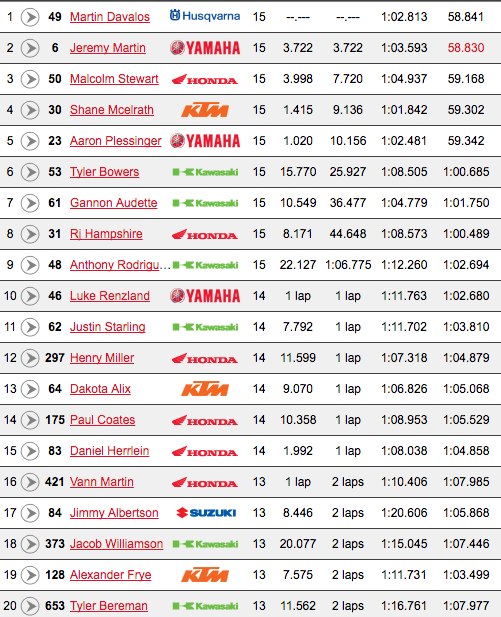 Meanwhile Dungey uncharacteristically dropped off the leader’s pace, and Roczen and Tomac got away. Anderson, from fourth, kept chipping away at his gap, and then in the second half of the race he was all over the champ. 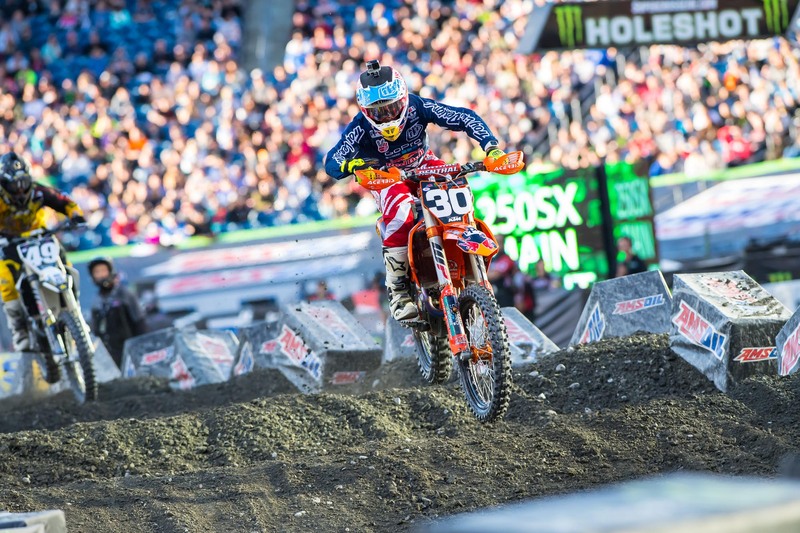 Dungey’s 30-race podium streak was in grave danger, and then Anderson pulled the trigger and made the pass for third. 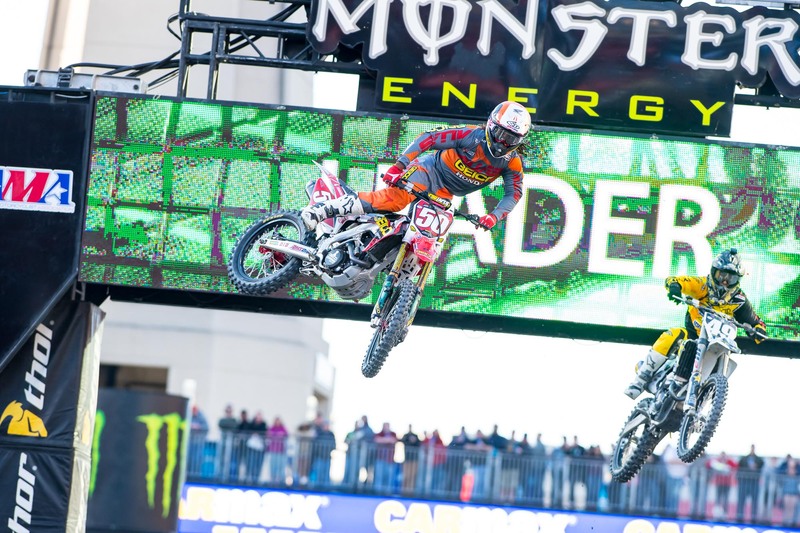 It looked like that battle was over as Anderson started pulling a bit of a gap, but then Dungey stabilized it. 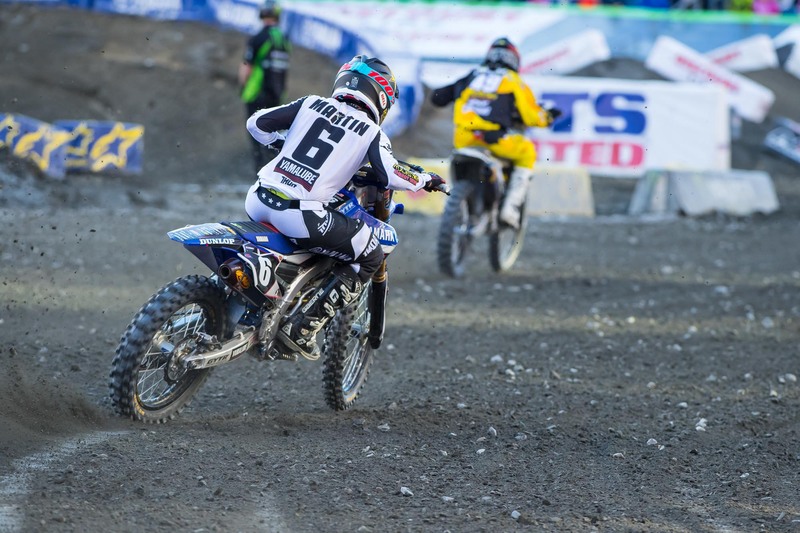 Then Anderson made a huge bobble in the whoops, and Dungey closed back in. Then next lap Anderson bobbled in the whoops again, and this time Dungey shot past to reclaim third. Anderson says his front brake went out and it made it hard to make the corner before the whoops cleanly, which ruined his entry to the section. Up front, Tomac got to Roczen’s fender, but had his own bobbles in the whoops a few times. This let Roczen pull it back out, and that was all he needed—Roczen had enough to take the win. 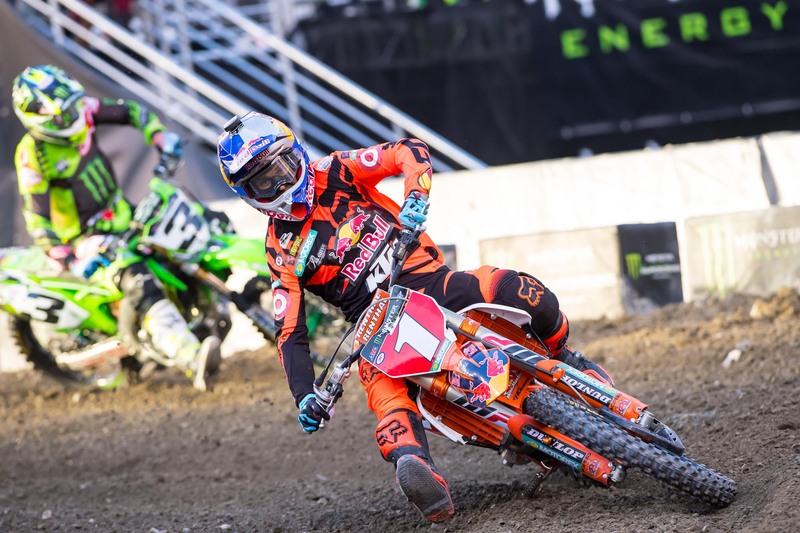 Tomac grabbed second and Dungey kept his podium streak alive with third, but his three-race win streak is over, plus, Roczen gets to at least stave off Dungey’s title clinch for at least one more weekend. 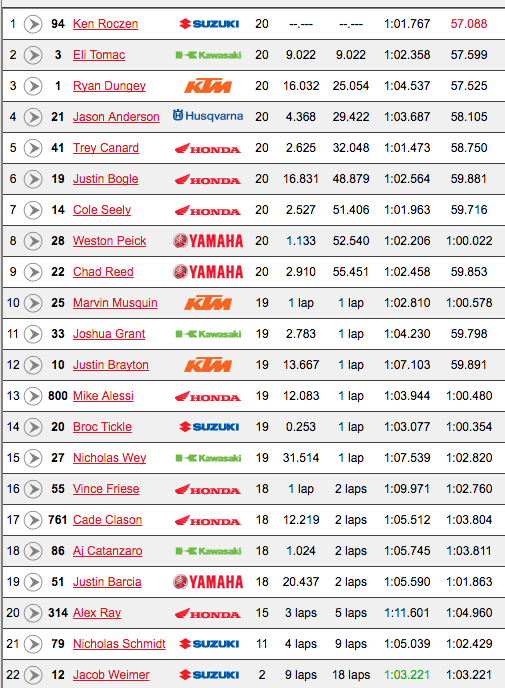 Anderson hung on for fourth ahead of Trey Canard. Dakota Alix pulled yet another killer start and grabbed the holeshot, but then he was passed by McElrath. Then Alix doubled the triple, caught a peg while trying to scrub, and crashed. This allowed Malcolm Stewart to get around him, and he wasted no time passing McElrath to take the lead on the first lap. At that point it looked like everything was going to roll Stewart's way. 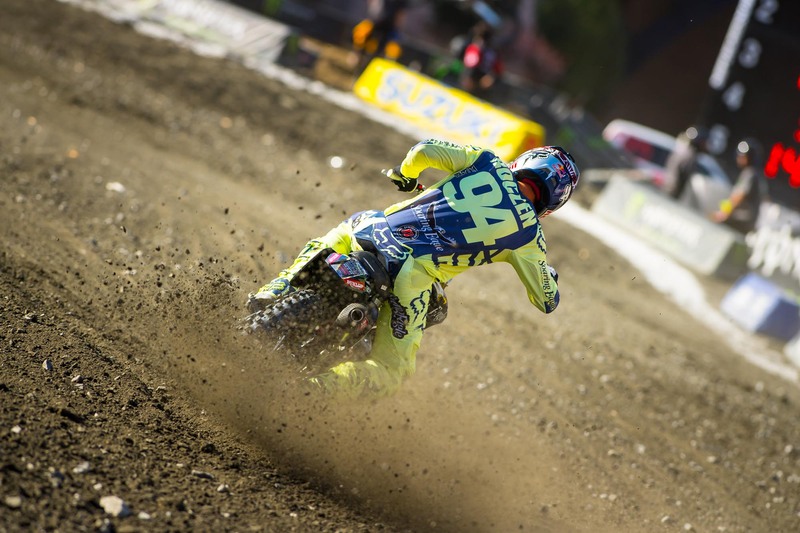 His title rivals, Jeremy Martin and Aaron Plessinger, started way back, and Stewart started pulling away quickly. But about five laps in, Stewart started to slow. Martin Davalos got a hook in McElrath, applied some pressure, and passed him for second. Then they both started to close on Stewart, igniting a three-way battle for the lead. 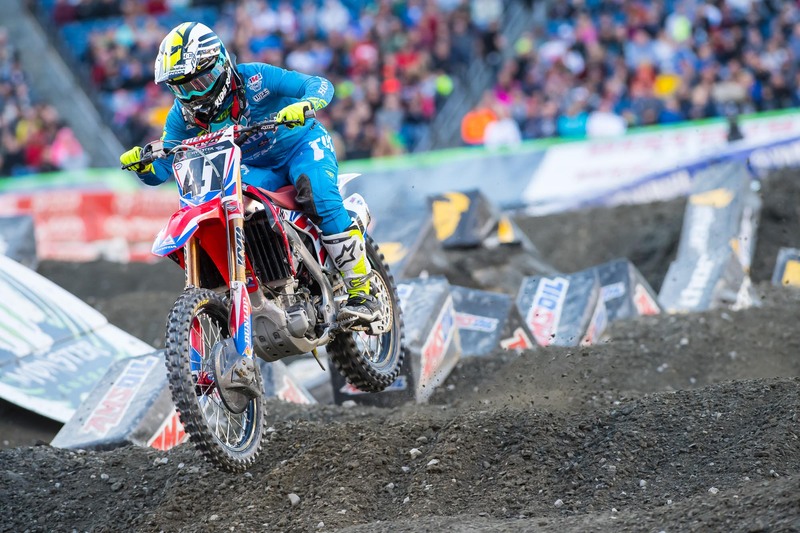 Stewart continued to slow, holding up both Martin and McElrath. By then Martin had climbed to fourth, and he was charging super hard, and caught the lead trio. Now a wild four-ride battle for the lead was set. 250SX East action. Catch the fever! After a lap of dueling, Davalos got Malcolm when Malcolm bobbled and didn’t jump the jump before the finish, this held up McElrath and allowed Martin to sneak past for third. Then Martin had to work on Stewart, and it took him one lap to get around his title rival. 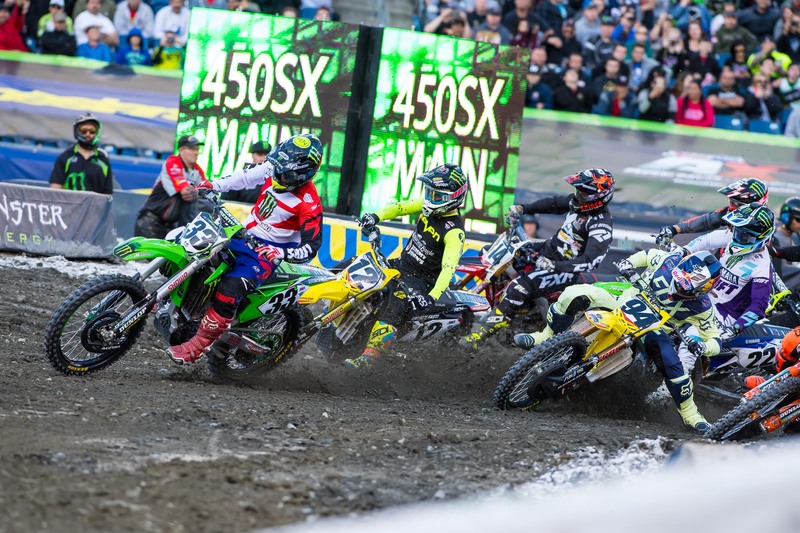 By the time he finally made the pass, Davalos had pulled back out—but Martin didn’t give up! He closed back in on Davalos and showed him a wheel for two laps, and it looked like the pass for the lead was inevitable. Martin had a new line using an outside line and jumping a triple into a rhythm lane, and twice he got inside of Davalos but wasn't quite close enough to make a block pass. Davalos hung tough under pressure, and then Martin made a bobble in a rhythm lane and couldn’t double, letting Davalos pull it back out. Then Martin had more trouble in lapped traffic, and that was all she wrote—Davalos had a big enough lead to cruise on the last lap. Stewart hung on for third, and Plessinger, who started even worse than Martin, got around McElrath and made a huge charge late to nearly catch Stewart. He ran out of time. 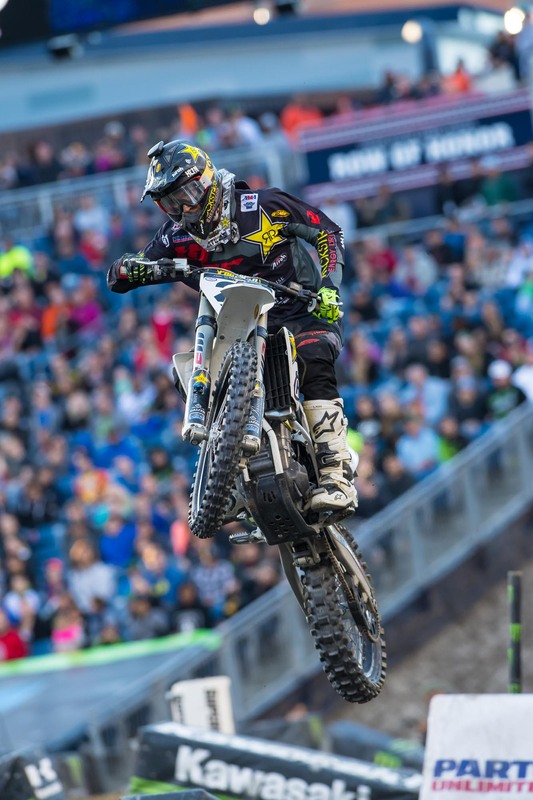 Davalos' win is his second of the season, following his victory at the Atlanta opener. 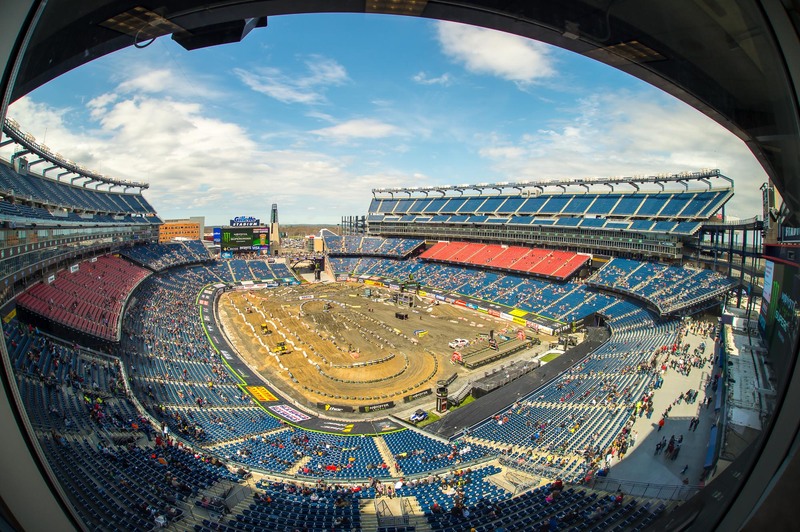 Finally, supercross has come back to Foxborough! 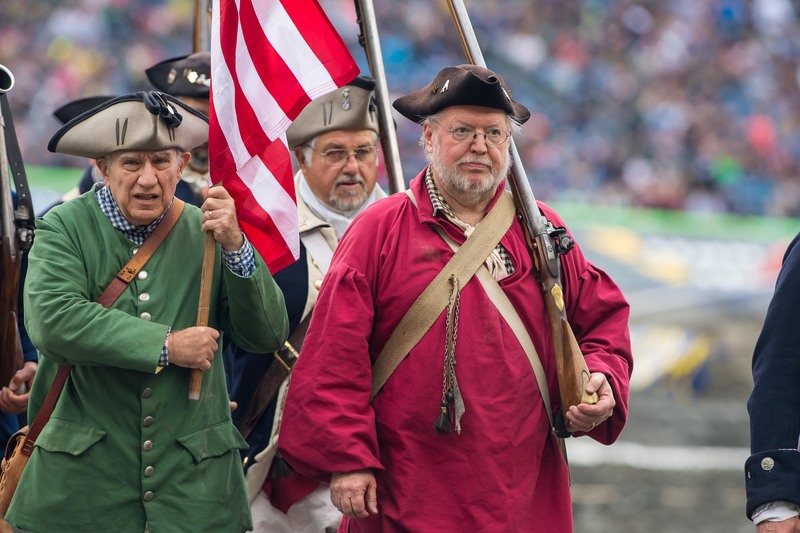 As a nice bonus, New England decided to treat Monster Energy Supercross fans to some classic New England weather, with light rain and drizzle all morning. Perhaps all-time local legend Doug Henry summed it up by saying on Supercross Live! "This is New England racing weather." It wasn't heavy, but the rain wasn't expected, so the track was left uncovered. The first practice sessions were cancelled and when the riders rolled out for the first timed sessions, the track was super treacherous. Top riders were struggling to double the triples, and one whoop section was nearly impassable. But lo and behold, after some laps were laid down and the mud started to sling off, there was some dry dirt underneath. Perhaps letting the track sit in the rain uncovered was by design? It might actually not be too bad tonight.